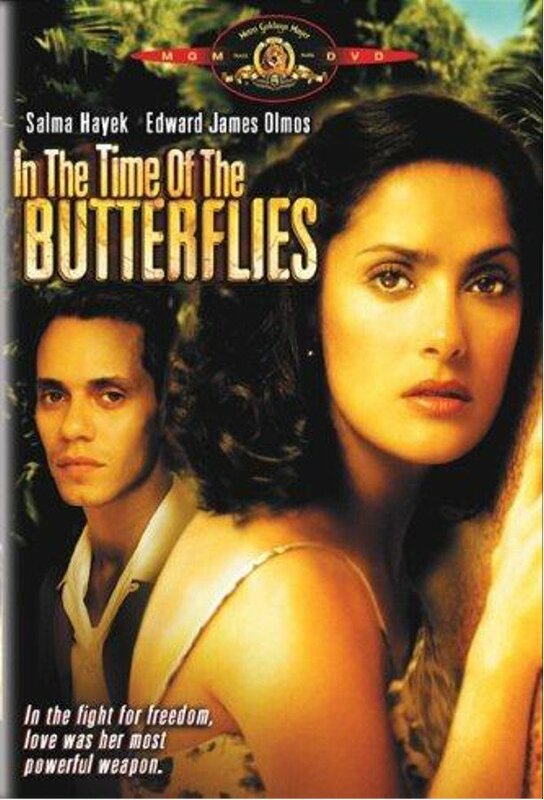 In the Time of the Butterflies is a 2001 feature film, produced for the Showtime television network, directed by Mariano Barroso based on the Julia Álvarezbook of the same name. The story is a fictionalized account of the lives of the Mirabal sisters, Dominican revolutionary activists, who opposed the dictatorship of Rafael Trujillo and were assassinated on November 25, 1960. In the film, Salma Hayek plays one of the sisters, Minerva, and Edward James Olmos plays the Dominican dictator Rafael Leónidas Trujillo whom the sisters opposed. Marc Anthony has a minor role as Minerva’s first love, and as the impetus for her later revolutionary activities.